I have been feeling like I should have 72 hour kits ready for my family for many, many months now. I do not think that anything is going to happen anytime soon, but I know it is the right thing to do. It is so hard to spend time, money and energy on something that doesn’t feel like it will be important right away, but when you need something, you need it, right? 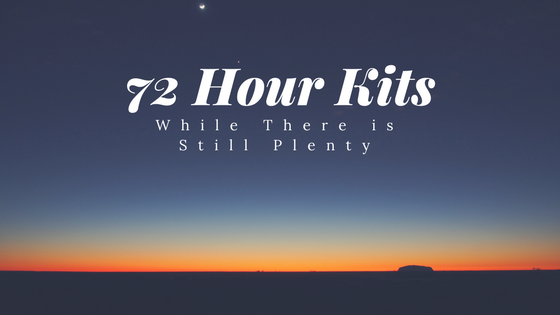 Many of you probably already have 72 hour kits. My sister has hers done along with water, food storage and anything else that she has felt impressed to have. She says having a plan has helped her children to feel confident and unafraid. I am motivated by the idea of calmly taking care of my children in an emergency situation. I am already an anxious person, so I do not need more reason to freak out when I need to be caring for my family. So, what do I need for these backpacks? This is a list of basic items I want to have. I have kept the list skimpy compared to some people and I don’t go into specifics in each item because I get overwhelmed with lists like that, so I thought maybe you would too. I need to start by just gathering the basics anyways and then I can add more over time. 1. I need to buy backpacks for everyone. I have considered using duffle bags that I got free through my husband’s work, but they will not be as easy to carry. With three little children, I want to be able to carry the stuff on my back and potentially carry a baby in my arms. Duffles would not work for us, but if you already have bags around the house that will work well to storage and portability, then save yourself some money. 2. I need to gather clothes for everyone. This one is tricky. Kids grow so dang fast. I will put in durable, comfortable clothes since that is what I will want to be wearing on the go. 3. I need to get food and water for each person. This is also tricky. My sister has MREs in her packs and they opened some of them as a family for family night just so there would be no major surprises when they used them later. I like that idea. I buy water bottles nearly every time I go to the store, so I will put some of those in the backpacks. 4. A hand-powered radio and flashlight. I like the idea of being able to be connected somehow to the rest of the world if something happens. The radios available now are pretty sweet…they include a flashlight, a phone charger and other handy things. 5. Personal documents and extra keys. I need to make sure everything is gathered into one place even just for reference anytime, but especially for when we need to leave quickly. 6. Cash and coins. I have no idea what the circumstances are going to be like when I need to use the kit, but this seems very practical, even if it doesn’t last in the long run. 7. Portable water filter. We have the Sawyer Water Filter and the Life Straw. 8. Medical kit. Remember this needs to include the needs of all your family members. For example, I need to have Maurie’s Epipen ready since she has severe allergies. 9. Kitchen tools. Wouldn’t it be annoying to have a delicious can of fruit and no can opener. This category needs some attention to detail because eating comfortably could make a big difference in an emergency situation. 10. Shelter and Blankets. Think tent, sleeping bags, pillows and blankets. We bought small down blankets for each girl’s backpack. We have yet to buy a easy to set up tent, but it is a priority. 11. Sanitation and hygiene items. Again, think of all the scenarios and what you would need to be comfortable, clean and safe. 12. Entertainment for all ages in our family. I have read that this is especially important for the children. They will be able to cope with the change better with some familiar activities and be distracted from the event. 13. Pencil and paper, needle and thread, map of area and whistle. There are lots of cases where these items will be important. Again, I have kept the list short, but I hope as you look at this you may find some gaps in your kit or just be reminded to check your existing supplies to make sure everything is ready to go. Do you have a emergency kit? If you do, how did you go about getting it all together? Here’s to a more prepared life!